This is perhaps Sassoon's best known poem. Short and to the point. with a beautifully planned and unexpected end. There is a story about the picture I have used. It is of Ted Soffe a member of a established family in the New Forest village where I live. 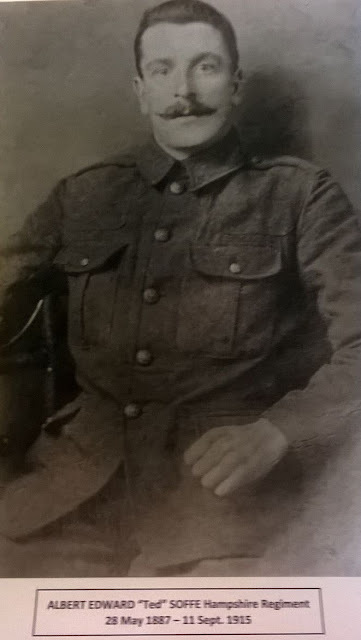 The family recently asked to have his picture (the one above) placed in our village church as a memorial to the 100th anniversary of his death in Gallipoli in September 2015. The picture is now on the altar and we are asked to pray for him and his comrades. Sassoon's poem backs up the feeling that the generals made a mess of this war. This was once the accepted view but, with time, opinion on this has shifted a little and many now think that the generals were faced with a totally new type of war and by and large did surprisingly well. The Gallipoli campaign however is still thought of as a fiasco and a terrible waste of life including that of Ted Soffe. So perhaps it makes sense to associate this poem with Gallipoli and Ted Soffe. Though, to be fair, the fault was more with the politician's than the military. Here is a good summary of story. The Australians and New Zealanders who suffered disproportional casualties still remain extremely bitter about Gallipoli. Overall there were well over 100,000 casualties in Gallipoli, many of them through disease rather than bullets with about two thirds of the casualties being Turkish. However in Turkey it is still regarded as a great victory. PS: I find that one historian who wrote of Gallipoli was a school friend of mine Robert Rhodes James, now sadly dead. I will always remember him for his wild enthusiasms for this, that and the other schoolboy craze and his consistent and much needed friendship when I was a new boy at the school. I miss you Rhodes James, and wish I had thought to thank you while you were still alive. PPS. I have now been in touch with Angela Rhodes James his wife and at least had the opportunity to tell her the story about her husband. I think it gave her pleasure to know that he was remembered from so long ago. She is currently working to put Rhodes James's archive on line. I think this is the link. I should really add a bit more about Ted Soffe. I hope to in due course.